Thank you for visiting our new Internet site. As an up-to-date business, we want to give you the opportunity to stay in touch with our company and our work. A new content management system will enable us to always keep you up to date. At present, our web site is still under construction. The emphasis of our site is on dipaying examples of our craftsmanship . Please visit our two galleries to see some examples of our work. In the meantime you can reach us at 1-847-352-3066 and by fax at 1-847-352-3575. We are looking forward to hearing from you. You can also contact us at our e-mail address: united.woodworking@sbcglobal.net. We would be pleased to hear from you! Please let us know what your needs and questions are, we will be more than happy to help. In brief, you should know the following about us: our company was established in 1984 and had been responsible for providing outstanding millwork ever since. 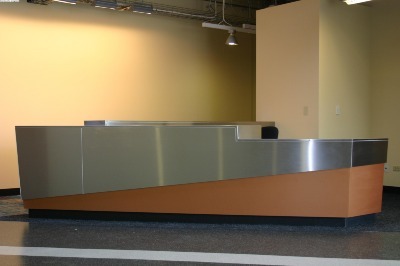 Our specialty is in the area custom wood and laminate casework and trim. Our regular customers particularly value our ability to provide a complete package of millwork, stone and decorative metal. Our business is located at 729 Lunt Ave. Schaumburg, il. 60193.